This semester I plan to focus on working in a way that incorporates processes and materials from multiple disciplines: metal, ceramic, textile and digital fabrication. I am interested in the connections and distinctions between art, craft, and design and I hope to address principles from all three areas into my work. The end goal of my experience in thesis is to create work that is displayed in a gallery setting but I also aim to hone my skills in order to support myself as a maker. I am looking to expand upon my experience last semester in designing and fabricating tiles using Rhino and the 3D printer. I want to design geometric faceted tiles based off of quilt patterns. To improve upon my previous work I intend to render a more complex pattern that requires more tiles to complete the pattern. I am going to aim for minimum of 5 different tile shapes, on a scale of no larger than 3 inches [to keep down my cost and maintain manageability]. I am going to use the same cone 2 Val Cushing tile body recipe I used last semester because I had a lot of success with it. I am interested in two different avenues as far as creating ceramic/ceramic-inspired textiles. My first idea is to recreate the porcelain disk beads that I made last semester and to knot them together with thread to create a moveable piece of “cloth”. What I will do with that cloth, I do not know. My second idea for textile exploration is to take photographs of different ceramic surfaces [most likely interesting glazes] and to enlarge the photos and transfer them onto fabric. I do not know if this is a process I can or will be able to do by hand or if this is something I will have to send away to have printed by professionals. I would like the then, in turn use those fabrics to create clothing from. In this exploration I’m interested in doing research in textile designs and the history of textiles as well as doing some more in-depth glaze research. If I am successful in rendering large-scale images of ceramic surfaces onto clothing I think I can spark an interesting dialogue between the maker and the wearer, utility and function, necessity and frivolity, etc. In the process of creating ceramic jewelry I would like to incorporate the skills I have learned in metal and digital fabrication. I have saved jewelry for my last exploration this semester because I don’t have any direction in the form that my jewelry will take and I know that I have a long process of research ahead of me just in order to learn about jewelry in a historical and contemporary context. 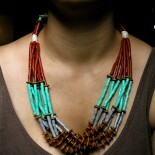 I also feel that my research in tiles and textiles can inform my jewelry process. I want to come at my work from a genuine and unique point of view but I also know like I will benefit from research in order to figure out where I want to fit in the big scheme of jewelry making. I do know that after creating slightly oversized jewelry last semester that I am aiming for a more wearable approach this time around. I assume that you are continuing to revise these three ideas. And now that I think about the first one, perhaps you should explore both the above idea and the idea that we talked about, using fewer tiles with a pattern built into each one. What’s the progress on this?